Correctional Industry programs contribute to the successful reentry of offenders by providing a structured environment for participants to learn the skills needed to obtain and retain post-release employment. Guided by evidence-based practices, Correctional Industries distinguishes itself by providing services that make an impact in reducing inmate recidivism. See how they make a significant difference in the lives of the offender population they serve and hear from national experts, correctional practitioners, and former offenders about the promising and evidenced-practices that impact recidivism. 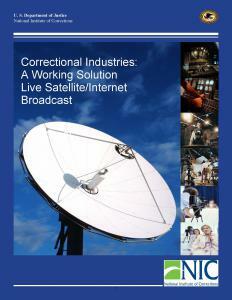 At the conclusion of this program broadcast on October 5, 2011, participants will be able to: describe the evolution of Correctional Industries from “producing quality products” to “developing individuals who produce quality products”; explain how the incorporation of evidence-based practices helps improve program outcomes; identify how Correctional Industries provides offenders with the skills they need to successfully obtain and retain post-release employment; and identify evidence-based training opportunities that promote professional growth and development.